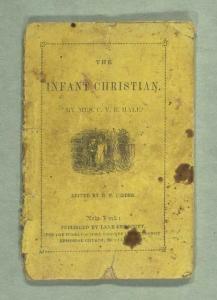 This is a children's story written in 1850 by Mrs. C. V. R. Hale for the Sunday-School Union of the Methodist Episcopal Church, New York, NY. By this time, under the leadership of Mr. Horace Bushnell (1807-1876), a Congregational minister in Connecticut, there was a change in the way adults regarded young children. Previously, the Puritans considered children to be depraved, that is, they were born sinful, and until they reached the age of reason there was no point in teaching them Christian values, because they were simply too immature, and their conversion narratives before that age were automatically suspect. With men like Mr. Bushnell, and authors like Mrs. Hale, this view shifted to one that was more sentimental of childhood. Eva, from Uncle Tom's Cabin, is a good example of this - someone who is young and innocent. Mr. Bushnell argued that it was essential to treat these young people as souls that needed to be nurtured in Christian virtues and values. This short story based on a real life situation shows this newer perspective clearly, seeking to encourage parents to teach their children well, even at a young age, the tenets of what they believe. The story tells of a young girl, who became a Christian at a young age, before dying at age five from scarlet fever. It served to encourage others, as it taught young children that they are not "too young to be a Christian," and that even the youngest in a family may believe in the Lord Jesus Christ and be given salvation from her sins. "Suffer little children to come unto me, and forbid them not." This admonition of our Saviour is as seasonable now as it was when it first fell from his lips. Parents do virtually forbid their children to come to Christ, by neglecting the use of early, believing efforts, for their salvation. There is, perhaps, no truth more overlooked by Christians than the probability of very early conversion in the hearts of children. As soon as the youthful mind reflects, it is able to trust in and love the Saviour. The artless affections of children receive the story of Jesus's dying love with a simplicity of which the seared heart of riper age knows but little. The first six years of life is an all-important season. Parent, teacher, then is the time to labor. After that the difficulties in the way of conversion increase each year. At this period a child's character is fast forming. In a short time it will take the mold which surrounding influences give; and probably retain the impression through life-through life! throughout eternity! Either parents do not believe this truth, or else they neglect it. Their indifference leads their children to think that they are too young to serve God; while the enemy of souls seconds with all his might the unbelief of parents and children. God often rebukes this want of faith; and shows, by impressive examples, his willingness to hear they prayers and bless the efforts of pious parents. As the following narrative, while it encourages the hearts of parents and teachers, is especially designed to interest children, the simplest language has been sought as best adapted to their comprehension. It may be remarked, that this beautiful instance of early and intelligent piety has not been painted in high colors for effect; but care has been used to keep within the bounds of strictest truth. And take your guilt away." ELIZABETH was the child of Christian parents; who began, when their children were very young, to tell them of the love of Jesus. It was in the pleasant town of Newark, New-Jersey, that Elizabeth was born, and passed the years of her short life. When she was only two years old she could sing correctly several hymns which she had learned from hearing them sung by others. Thus, while yet in her cradle, her sweet voice, which was soon to join with the songs of angels, sung the praises of God. In her third year she was sent to the infant school. Her teacher noticed, that when the children knelt down to pray, this little girl closed her eyes, and clasped her hands, while her face showed that she prayed with her heart. There are two ways of saying our prayers. One way is to ask God for what we need, and thank him for what he gives us, and feel what we are saying. Another way is to kneel down, repeat the words, but never feel what they mean. Which of these is the right way? The first, you will answer. Be careful, then, dear children; and when you kneel in prayer, say to yourselves, "I am going to speak to the great God." Elizabeth did not only say her prayers, but she prayed: and our heavenly Father, who hears even an infant's prayer, blessed her, by giving her a new heart. By the time of her fifth birthday came she could read; for she loved her book, and tried to learn. But long before she could read she loved to hear her mother tell how the Lord Jesus pitied sinners, and that he came from heaven, and became a man, that he might take our place, and bear the punishment our sins deserved. When she learned in her little catechism that we are born with wicked hearts, and that we cannot go to heaven with such sinful natures, she felt sorry she was so sinful, and she asked God every day to send the Holy Spirit to change her heart, that she might be able to love and serve him. The Sabbath school, and, next to that, the infant school, were her great delight. There she loved to be, and nothing but illness or bad weather kept her away. "They that seek me early shall find me." This is God's promise to children. Does any child ask what it is to seek God? It is to do what Elizabeth did. It is to pray to him with your heart,-to give yourself to be the child of the Lord Jesus, and do what he tells you in the Bible. I said that the Lord was pleased to answer this little girl's prayer, and give her a new heart. Just as we always went." We think that Elizabeth had genuine repentance. She was sorry for her sins. Sometimes, when her mamma was praying with the children, she would weep; and once, after morning worship, she said, "What a beautiful prayer papa made to-day!" Her mother asked her why she thought so. She said, "Those words were in it: ‘Seek the Lord while he may be found; call upon him while he is near!'" About this time she was very ill with the scarlet fever. Her life was in great danger; but she was spared to live one more year. Our Saviour has told us: "In my Father's house are many mansions. I go to prepare a place for you." If we ask him, he will send the blessed Spirit to prepare our hearts for heaven. So he made the heart of this dear child to be fit to be with him when he thought best to take her from this world. "How soon my little strength has fled! And love me to the last!" One sabbath evening Elizabeth complained of being ill. She grew worse through the week, until her disease was found to be dropsy of the brain. This is a distressing sickness. She suffered great pain; and sometimes she lost her reason, so that she could not think or pray. When she was in her senses she said she did not expect to get well. She told her mamma, "I shall never see my dear sabbath or infant school again." She wanted to recover, that she might go to those places which she loved so much. But Jesus had prepared a happier place for her. O if she could come back to earth, what glorious things she could speak of! and how she would persuade all children to love the kind Saviour. In the beginning of her illness Elizabeth felt herself to be a sinful child in the sight of God. This made her pray. As she lay on her little bed she was heard to say, "Lord Jesus, come and take away my heart of stone. Give me a new heart,-a heart of flesh!" Another time she prayed, "Lord Jesus, have mercy upon me, a sinner! Take away my wicked heart, or I must sink to hell!" She often desired her parents to pray with her; and while they were praying she seemed to join with them with great feeling. On Wednesday, after her father had prayed, she was much affected. He asked her if she loved Jesus. She said she did, and had given herself to him. She then called her brothers and sisters to the bed-side, and begged them to remember the words of their dying sister,-"Never quarrel, never fight. Love the blessed Saviour, and he will love you." What shall then become of thee?" This she said kindly, but in a solemn manner. When asked if she could tell what she must do to be saved, she was silent awhile, as if she was thinking, and then replied, "Yes, I can: give my heart to Christ." She loved to have her mamma near her; and would often put her little arms round her neck, saying, "Dear mamma, how I love you!" It distressed her to see her mother weep. "Do not grieve for me," she said; "it makes me worse to see you cry." She desired her minister to visit her, and was delighted to hear him pray. When he talked with her about the state of her mind, and asked how she felt when she thought of dying, she gave such clear answers as rejoiced his heart. Often she repeated the prayer of David, "Create in me a clean heart, O God, and renew a right spirit within me." Elizabeth fell asleep in Jesus. Her body has long ago returned to dust, but her soul has been all this time happy in heaven with the Saviour. Let me tell you how she felt when she was dying. My dear children, pray that you too may have that love to God, which made the deathbed of this little girl "feel soft as downy pillows are." The fifth day of her sickness she was very ill. Her distress, both of mind and body was great, and she felt that help could come only from God. She begged her papa and mamma both to pray for her; and while they were asking the Lord to bless her, she lifted her trembling hands to heaven, while her broken sobs and tears expressed how much she felt. When they had finished, she seemed full of joy, and said, "Ma, it seems to me I never prayed before!" Rise glorious at the judgment-day!" Their tears he'll wipe away. To dwell with him above." Be unto the Lamb forever." Being asked again if she loved the Saviour, she replied, "Yes: I will sing his praise with the happy spirits in heaven." As her mother was watching by her bed, holding her burning hands, she said, "I want a staff, and you want one, mother, while you are traveling here below." I suppose she was thinking of the twenty-third Psalm; where it is said, "Thy rod and thy staff they comfort me." The next day her strength failed fast, though she did not lose her senses. Her sufferings increased till evening, when she was asked if she still hoped to go to heaven. She replied, "Yes." She then lay some time praying, and said, three times, "God, have mercy upon me!" These were the last words she spoke. Soon after she lost her mind, and lay as if she was asleep, until her spirit left the body, and was taken to rest in the bosom of the Good Shepherd. First. She felt she was a sinner, and was sorry with a godly sorrowing: that is, she repented of her sins. Second. She came to the Lord Jesus, and asked him to save her from her sins: in other words, she prayed in sincerity. And, third, she believed in him, and loved him. Thus she had repentance toward God, and faith toward our Lord Jesus Christ. Finally, she showed right feelings, by being patient, thankful, and willing to die, that she might be with her God. Elizabeth's funeral was an affecting scene. All the scholars of the Infant School assembled around the coffin, to take leave of their playmate. The minister spoke to them of her love for the Saviour, and her happy death. They all joined in singing her favorite hymn, "Lord, teach a little child to pray:" and when prayer had been offered, they carried her to the grave-yard, and laid her in her last resting-place. But she will not always sleep there. He who died for sinners will not forget Elizabeth. At the last day she will rise a glorious form, to live for ever with the good in the presence of God. In conclusion, let no little child say, "I am too young to be a Christian." No, dear children, you are not too young: you are old enough to sin, to be sick, to suffer, and to die. Then you need a Saviour now; and even should you live to grow old, you will, as Elizabeth said, want "a staff to lean on while you are traveling through the world." Religion is such a staff. And give ourselves to God." Author/Creator: Hale, Mrs. C. V. R.